Turning your photos into beautiful canvas works of art is what we do, and we’ve perfected our process so you get a stunning result at an affordable price. Whether you’re a professional photographer looking to showcase your work, or an Instagram aficionado wanting to make the most of the photos you’ve snapped on your smartphone, we’re here to help turn your favourite images into works of art in six easy steps. Starting at just £9.99 with FREE next day delivery* and a 100% money back guarantee, you get a beautiful canvas print in a range of sizes, and in classic shapes that suit whichever room you’re looking to brighten. We combine cutting-edge printing technology with archival-grade materials to turn your photo into a canvas print that you’ll love enough to display in your home, or that you’re proud to give as a gift. And because we know the effort you’ve put into taking the perfect photo, we’ve taken all the hard work out of transferring your photo to canvas—you just upload your photo and we’ll take care of the rest. There’s no technical know-how required on your part, so don’t worry if you’re new to this! We’ve made it easy for you to turn your photo into a canvas print. 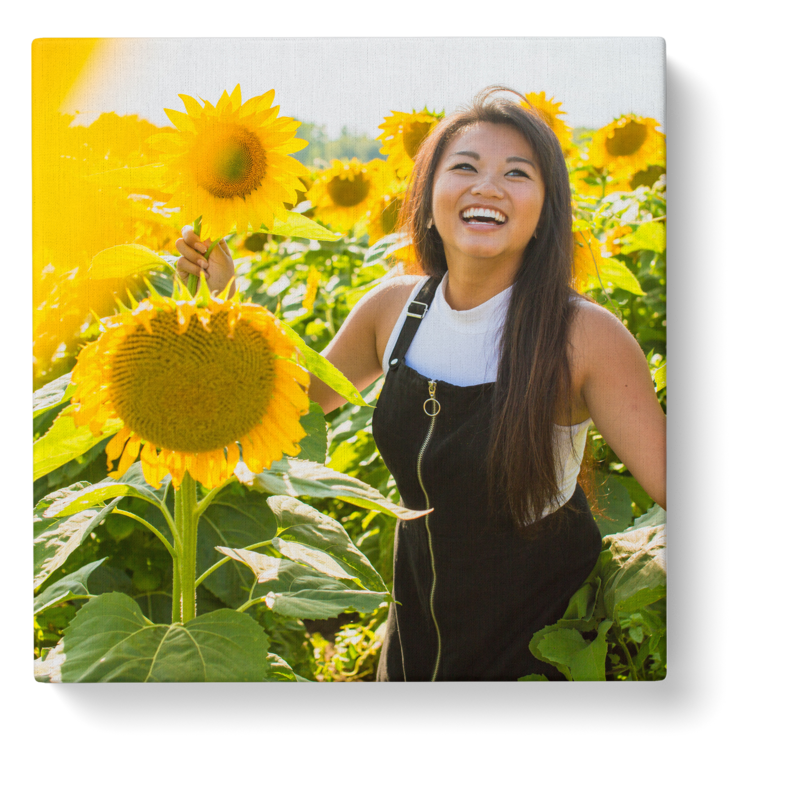 Simply upload your photo to our special canvas builder, and our state-of-the-art software will enhance your image so it’s crisp, clear, and sharp, without any pixelation or loss of detail. Our friendly customer service team are on call to help you if you have any difficulty, so there’s no need to worry about doing the wrong thing. Customise your image exactly the way you want it—you can add any captions or other enhancements with your own editing software before you upload it. Once you’ve uploaded it, you get the option to pass your image through our colour correction software, or to apply a black & white or sepia finish, before we transfer your photo to canvas. Parrot Print was started by a group of photographers who wanted to see their photos displayed in the best way possible, and give you the same experience. This is why we’ve taken extra steps to ensure you get consistent photo quality with our anti-pixelation guarantee. If you need any help or advice about how to get your ideas onto canvas, or even some guidance on which images would look best, then get in touch. We love hearing about your ideas and helping you bring your memories to life on canvas. We use solid 18mm European pine framing and 420gsm heavyweight premium archival-grade canvas, and our frames are designed specifically for photography and fine art production. Each one is hand-made by master craftsmen right here in the UK, so you know you’re getting a quality product that’s built to last. Our 100-year+ fade-resistant pigment inks give your print bright, vibrant colours that stay bold and clean, no matter where you display it. Your canvas print is laminated by hand using archival grade fine art satin printing varnish, so it’s protected from the wear and tear of everyday life. Our varnish also protects your canvas print from harsh UV rays, so it won’t fade in the sun. We know you’ll love your print as much as we do, so that’s why you get free delivery to anywhere in the mainland UK when you spend over £20. We even give you our Love It! 100% Happiness Guarantee, which means that we promise your new canvas print will get to you safe and sound and in perfect condition, and you’ll absolutely love it, or we’ll give you a full refund. Don’t let the memories you’ve uploaded to your favourite social media platforms disappear. Our image uploader enables you to take your images from Facebook, Instagram, or your tablet or smartphone, and have them turned into a beautiful canvas print.